I love surprises, don't you? Especially when it's to do with something that you've really worked hard at. 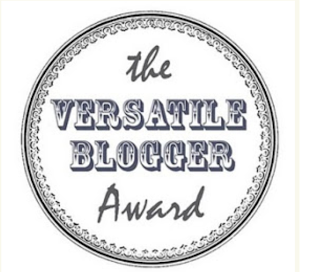 Well this happened to me last week, when the lovely Lauren (seriously, her blog is awesome) contacted me to nominate me for The Versatile Blogger Award! It was a total surprise and I'm so touched by it! 1. I act, and I have a movie out at the moment called OXV: The Manual. It's doing the festival circuit right now, but if you want to keep up with it, check out the Facebook page here. 2. My favourite ways to relax is are either to snuggle up on the sofa with a film, or sing and play my guitar. I'm definitely a chords kinda girl! I started playing when I was 11. 3. Petwise, I've only ever had guinea-pigs! They are just the cutest things, and have such great characters! But I would love a dog. That's my dream. 4. My cooking disasters usually turn into triumphs. I once attempted a blueberry cheesecake for my mum's birthday, but the cream cheese ran to the bottom of the tin so it turned into a sort of upside down cake! My parents told me it was the best cheesecake they'd ever tasted! I bet I couldn't repeat it if I tried though! 5. My favourite colour is blue, any blue! 6. I'm a big Taylor Swift fan, she got me through some real hard times over the past couple of years, and I'm going to see her on her RED tour on 10th February 2014!!!!!!! 7. Last makeup item I bought was Rimmel London Wake Me Up Foundation. Let me know when you've done your post so I can learn some more about you guys!